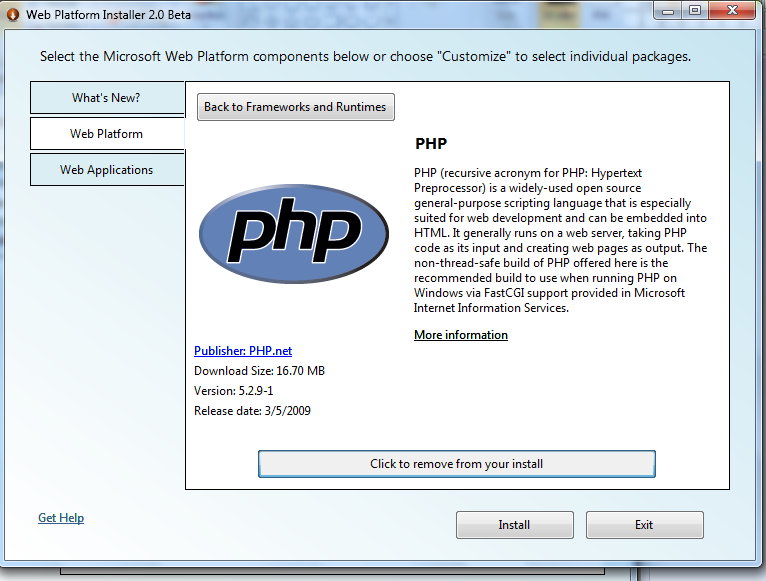 If you want to easily install PHP on Windows, you can use the newly released Microsoft Web Platform Installer v2 Beta to get the public community version of PHP ((VC6 x86 non thread safe installer build) on Windows XP/Vista/Server 2003/Server 2008/Win 7 with IIS and the Microsoft Web Platform. The Windows Installer for PHP also automatically configures IIS FastCGI as part of its setup. 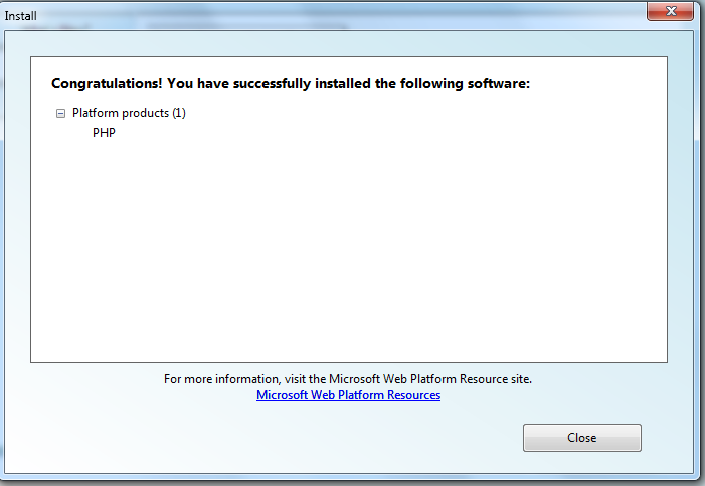 Install the Web Platform Installer v2 Beta if you don't have it already from here. Go to the Web Platform tab. 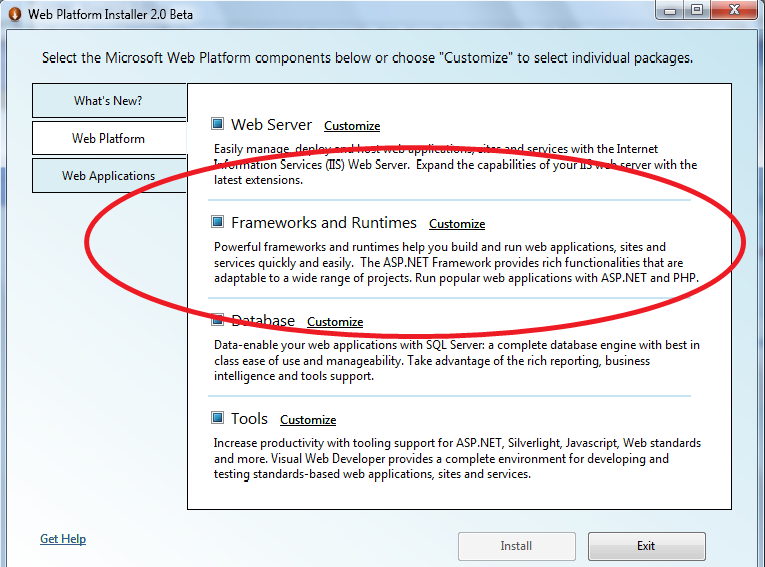 Click on "Customize" on the Frameworks and Runtimes category. Select PHP from the list of Frameworks and Runtimes. Go through the install experience...then you're done! PHP is installed. You can also go directly to the Windows on PHP community Web site to download PHP on Windows. Note that if you install a Web App Gallery PHP application using the Web Platform Installer and do not have PHP installed on your computer, Web PI will automatically install PHP as a dependency of the application. More about Web Platform Installer's new support for PHP and Web App Gallery applications here. More about PHP support on IIS here. I used this new approach - and now my web sites will not display - and the working PHP installation I had, has been completely trashed. Hi, robtheailean: sorry to hear that your web sites not displaying. :-( It would be great if you could ping ksingla@microsoft.com and/or me at mailant@microsoft.com so that we can learn more about version of PHP you had on your box and check out the logs from WebPI. My original intent was to get WordPress up - and foolishly assumed (first rule - never assume!) - if I did it the "Microsoft Way" - I would avoid the many pitfalls I read about on seeveral PHP/Wordpress forums regarding the installation of these items. will do and thank you for your constructive response. 1. The WebPI does work for both IIS 6 and IIS 7 -- we have a fastcgi component for IIS 6 that WebPI will install as part of the dependency for a PHP application. FastCGI ships in the box for IIS7. So we should work fine on IIS6 too. 2. We are using the Windows installer for community PHP (http://windows.php.net) and work closely with John who runs that community PHP branch. We work together to figure out where bugs live and collaborate on making sure that we can fix problems for Windows users. 3. We don't have uninstall right now in WebPI. :-( So we will lay down a version of PHP but we won't uninstall your existing version of PHP. Sometimes (perhaps in robtheailean's case) that can cause a problem -- hard to tell since environments can vary dramatically. One way to make sure that you don't run into problems is to manually uninstall the PHP version that you have right now (if you want to) and then run WebPI to install the versionn of latest stable branch of PHP. I understand that this might not be possible in some cases since you have apps that might depend on whatever version of PHP you run today. But it is a good way to make sure that your environment is "clean" for the installation using WebPI -- which will also make sure that your other PHP dependencies on Windows (like FastCGI) are there first and set up right. By the way, yesterday we updated the PHP version in WebPI to install 5.2.9-2, which released yesterday on http://windows.php.net with a security patch. Our goal is to make sure that users can access the latest secure version of the latest stable build of PHP. Sorry, a few comments got stuck and didn't post. I wanted to circle around to answer them. Hi, Michael: Web PI v2 beta is exactly for that purpose of making it easy to get up and running with a Web app on a Windows computer. 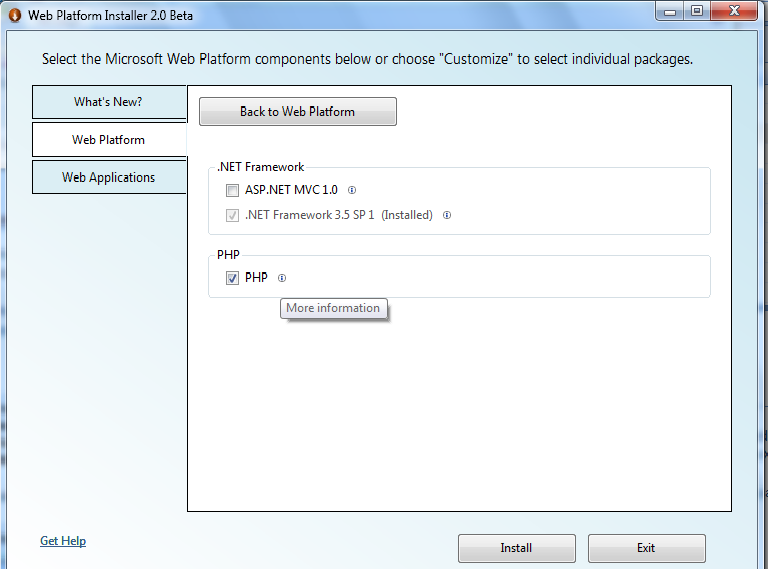 If you want to read more about WebPI v2 beta, you can check out this whitepaper at http://learn.iis.net/page.aspx/616/introducing-the-microsoft-web-platform-installer/. I will send you a separate email to find out where you are having problems. Another approach is to post questions in the Web PI forum where you can get free help from our product team: http://forums.iis.net/1155.aspx. One thing I do want to call out is that we have been hearing that folks are having problems with installing from behind proxies. We are in the process of getting a new build ready for WebPI that fixes this problem. Because of how WebPI is built, you don't have to install a new version of WebPI -- your existing version of WebPI will auto-update with the latest build, which should be out in the next week or so. Hi, Paul: Can you give me some more information (or create a post in http://forums.iis.net/1155.aspx) about if you had a pre-existing version of PHP installed on your machine? WebPI keeps pretty good log files too so we'd like to look at those. For the anonymous question about graphics, I wanted to see if you meant that there were no graphics on the Web apps or no graphics for the details page for WebPI. You can also post your question to the Web PI forum (http://forums.iis.net/1155.aspx) if you want. Another resource is the Troubleshooting doc for WebPI at http://learn.iis.net/page.aspx/604/troubleshooting-problems-with-web-platform-installer-20/. Hope that helps. Let me know if you have more questions or can share more info. Hi, Paul: You unfortunately ran into a problem that we saw for a few hours yesterday morning. Every time we update a package that gets installed by WebPI, we have to update a MD5 hash so that we can verify integrity in the source for download. For a few hours yesterday morning, the PHP install was down within WebPI because the PHP 5.2.9-2 package got updated with a library change and we didn't regenerate a MD5 hash. Ergo, PHP install failed with that error. We fixed it within a few hours (and are going to figure out a process to minimize this sort of thing in the future) but sounds like you were in that window. If you are up to it, can you try again? Should be working now. Also, if you have any questions, you can also post to our Web Platform Installer forum at http://forums.iis.net/1155.aspx. Hi, all: I wanted to pop back in and answer comments...one thing to note is that if you go into the Web PI user forum (http://forums.iis.net/1155.aspx), you can also post your questions there and a member of the community, feature team or our support will be able to answer more quickly. 1. We were seeing a lot of proxy issues so we issued a refresh of WebPI. After we post a refresh, the next time you launch WebPI, you will be asked to upgrade your version. If you accept, you will get the latest build which fixes known proxy issues. If not, then you might see these again. 2. We are seeing some cases where previous installations of PHP are causing some odd behaviors when 5.2.9-2 is installed. I would post your questions to http://forums.iis.net/1104.aspx. In this directory and all its subdirectories you will find the installation logs of all the products WebPI installs. WebPI also displays a link to the log file that failed in its summary screen. I would recommend checking out those log files and copying the contents in a forum post. That makes it much easier to figure out what's going with your machine. Well, despite all the brou-ha-ha above, I tried this technique and had zero problems. In every case, FastCGI and PHP have installed without a hitch; and in every case except IIS6 on Server 2003, everything's working as expected. For whatever reason though, despite what appears to be identical configurations, IIS 6 doesn't seem to process PHP pages. When we hit our PHP pages -- the ones that work out-of-the-box on the other three platforms I mentioned above -- IIS 6 returns a generic 404 error. Not only is the PHP not processed, but the static parts of the pages aren't even served to the web browser. IIS 6 is still serving our internal SharePoint site and static HTML pages.